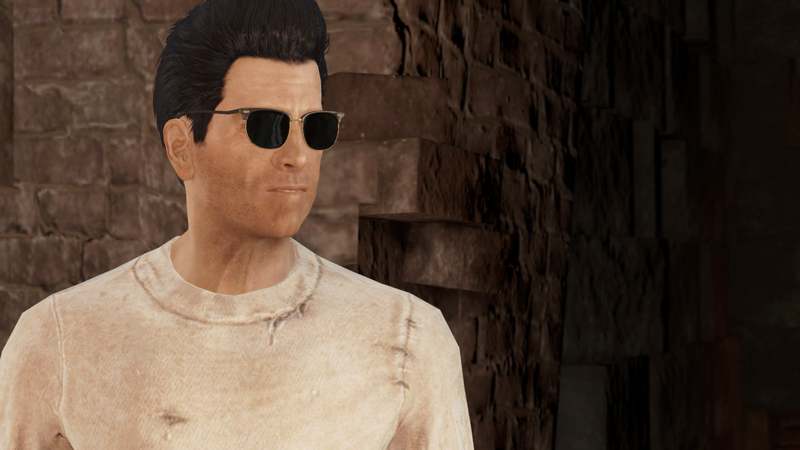 I’m still slowly working my way through Fallout 4, and every venture out into the wasteland continues to surprise me. I’ve come across several things in my travels that made me stop and scratch my head, laugh or simply smile, and it’s crazy to think these are things that people could entirely miss if they’re not keeping their eyes peeled. These little things have no impact on the gameplay, but they certainly make me appreciate the world of Fallout 4 even more. I came across the scene above after accidentally strolling into a subway station. I didn’t intend to enter the station at all, I just got too close to the entrance and the game automatically transitioned me into the station. 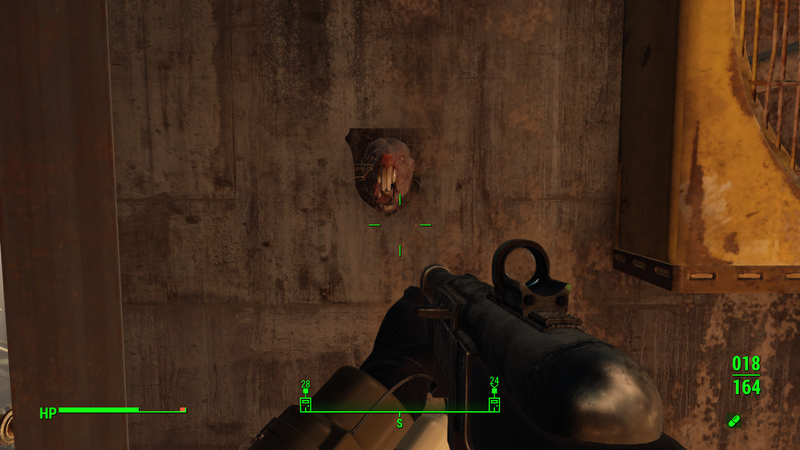 At first I was a little annoyed, knowing I’d have to face additional loading time to get back into the Commonwealth, however once inside I figured I’d at least see if there was anything worth grabbing. I didn’t find much, and the skeleton and teddy bear above didn’t even catch my eye at first. I just saw another dead body as I looked around for any interesting loot. As I was preparing to leave the area I just happened to glance down at the two and could not help but laugh out loud once I saw them sitting there. I could just imagine the man saying “screw it”, throwing shades and a hat on himself and the bear and lighting a cigar as the world collapsed around him. What a way to go. I couldn’t even bring myself to loot their sunglasses, I had to leave them be. 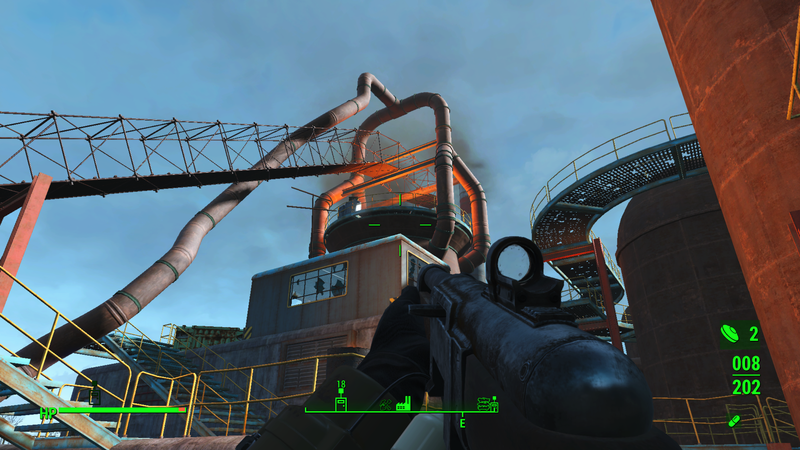 It wouldn’t be a day of Fallout if I didn’t die in some stupid way. Today’s silly death came via the forge. I had read the terminal inside that featured a list of names, most of which met their fate by being fed to the forge, but when I saw got outside and saw the forge the fact that I was looking at a stairway to death didn’t even cross my mind. I figured there had to be loot up there, and even though I looked right at it, I failed to notice that the gap in the floor that would lead to my agonizing death. As I fell into the forge I couldn’t even be mad. Just before I finished playing for the day I finally came across the railroad, and the characters that I’ve met so far are some of the most interesting I’ve come across recently. I’m excited to dive into the quest line and see what adventure awaits me next. 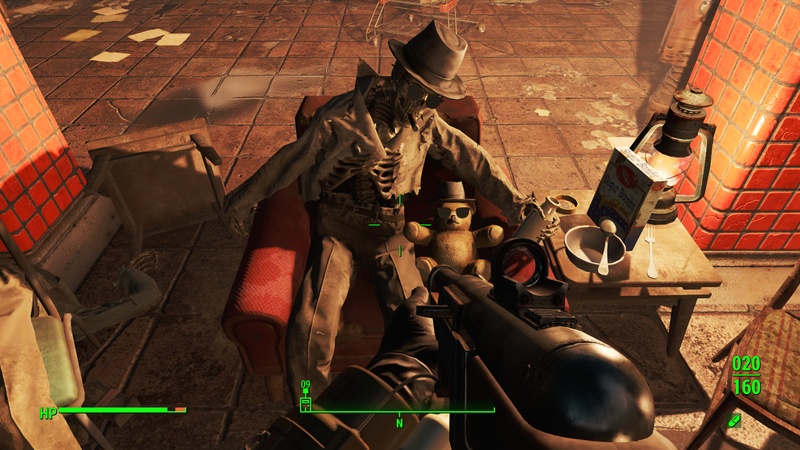 This entry was posted in Video Games and tagged Fallout 4, Fallout 4 forge, Fallout 4 molerat mount, Fallout 4 skeleton and teddy bear, Fallout 4 stupid deaths, video games, Xbox, Xbox One. Bookmark the permalink. What platform will you get Battlefield 1 on? Can you use regular headphones with Xbox One headset adapter?